The Three Lieutenants, or, Naval Life in the Nineteenth Century - W. H. G. Kingston 1897 - Griffith Farran Browne & Co. Limited, London	Illustrations by Charles J. de Lacy. From the Boys’ Own Favourite Library series. The second novel in Kingstons series which began with ‘The Midshipmen’. A lovely copy in pictorial boardsand gilt edges. Kingston's reputation was made by these books, that first appeared about 1860, and dealt with an officer's life in the Navy at about that time. By an extraordinary coincidence, the three young men who had met as midshipmen, get postings that enable them to keep their friendships alive when they are lieutenants. Another old friend is Admiral Triton, who, though retired, takes a great interest in their careers. 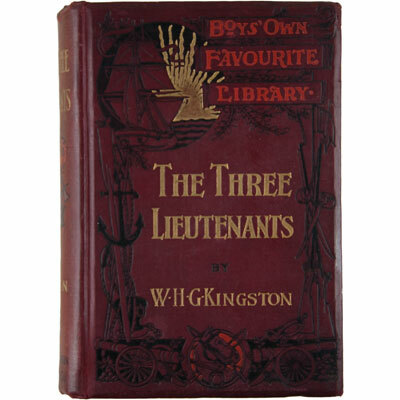 This series of four books were among the first written by Kingston, and were published serially in weekly magazines.